We all know everybody has one. The wrestling nerd in me would always itch to say Stone Cold Steve Austin’s entrance music or Chris Jericho’s “Break Down The Wall”, but being the huge Dean Martin fan that I am, I’d always pick his rendition of “Volare”; a little off the beaten musical path so to speak, and plus, Dino’s the coolest cat to hit the western hemisphere probably this side of Honest Abe. I figured, no one would consider a singer & standards tune from the fifties an acceptable sound to walk up to the plate with two outs in the bottom of the ninth, but damn, it’d sure be a great tribute to a guy who was born almost 100 years ago just across the border over in Steubenville, OH. But then Francisco Cervelli stole my croonin’ thunder with “That’s Amore” and I couldn’t have been happier. If you’re looking for headlines of the 2017 Pirates, it would either be the front office’s lack of offseason moves or the fate of Andrew McCutchen, whether it’s in the left field of PNC or in another uniform. Both of those talking points are scary enough for any Pirate fan, but my baseball heart almost leapt out of my chest when I caught wind that Cervelli potentially injured his foot last week at the start of Spring Training. Luckily, it seems like a false alarm, as he’s walking fine and listed day-to-day, but I had that initial fear of my favorite Pirate missing any substantial playing time again. After all, I’d argue that if any one player is the heart of the team, Cervelli would be it, both from a fan and clubhouse perspective, the latter being the more pertinent when regarding the (hopeful) success of the 2017 Pittsburgh Pirates. In light of the very few acquisitions made this winter, Cervelli's positive energy could play a big factor in keeping the troops motivated. I knew of Cervelli before his joining of the Pirates when he signed with the Yankees as an international free agent back in 2003. I’m always the sucker on the lookout for an Italian last name in the sports world (see “Testaverde”, “Marino” and “Montana” for past reference), and a name with that many vowels certainly rung that heritage bell. You combine that with his recruitment from the blue and gray “Evil Empire”, it sounded like a potential recipe for Yogi Berra Part Deux. Such things, especially in the world of baseball, never go as well as expected. In addition to backing up Jorge Posada and Russell Martin, Cervelli only managed to stay healthy enough to play over 50 games once in his six-season stay in the Big Apple, struggling from a cornucopia of injuries ranging from concussions, to a broken hand, to a hamstring injury to cluster migraines. On top of that, in 2013 he was suspended for 50 games after being connected to PEDs (which he's been open about). 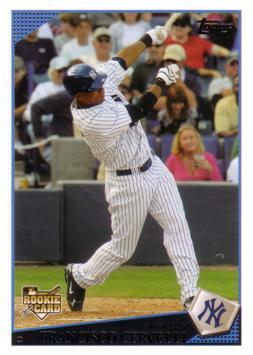 If his 2009 Topps rookie card was any indication of his Yankee tenure (the player pictured wasn’t actually him), then it sure was a bummer of a foreshadow. By the off-season of 2014, his time in pinstripes was officially over, but we’re all too familiar with one the aforementioned Berra’s "it ain't over til it's over" quip and Cervelli’s career certainly would live up to that. He was traded to the Buccos in November of 2014. From there, any Pirates fan, young or old know of the thrill ride that was the 2015 regular season. Although I was living in Philadelphia at the time, I made sure that I tagged along for that ride through the benefit of MLB.TV. The style and hustle of the team, particularly Cervelli’s, had me hook, line and sinker (that and the Dean Martin, of course). To see his excitement and his candidness when he was at the plate or behind it made him and those 2015 Pirates all the more relatable and captured the essence of the city’s excitement at the time - something that was palpable even if I was 400 something odd miles away. I felt if there was anything comparable to the “We Are Family” days of 1979 then this had to be the closest thing going. If 2015 was the equivalent to a fantastical drunken night out on the town, then 2016 was the immobilizing hangover the morning after. “The Pride of Pine Richland” was traded (aka: dumped) for John Niese, the unexpected contributing arm of J.A. Happ was now off in Toronto with several other Bucco alumni, inconsistent play on the mound, and Cutch not being Cutch were just a few of the factors that came into play in the sobering 78-83-1 record. Now we enter this 2017 season with a lot of uncertainties, but one thing that will hopefully “hit our eye like a big pizza pie” is that Cervelli positivity and perseverance. We sure will need it.